The young Orson Welles: slept by turf fires in Connemara. Hilton’s fussing over Orson, and Orson’s obvious talent. About his lover Hilton need not have worried. Orson was, and would always remain, enthusiastically heterosexual. But Mícheál’s other great fear, that he would be upstaged by this newcomer, was confirmed when Orson received a standing ovation for his performance on the play’s opening night. Orson Welles’ time in Ireland was to impact on him for the rest of his, largely unfulfilled, creative life. He arrived here in rather unusual circumstances. Born in Wisconsin in 1915, Orson’s mother died when he was nine years of age; his father died from an alcohol-related illness six years later. Thereafter he fell under the guardianship of Maurice Bernstein, a Jewish doctor in Chicago. When the precocious Orson announced that he was leaving school at 16 years of age, it was impossible to stop him. He agreed that he might consider a university education later, but first he wanted to make a cultural tour of Europe. This was agreed. Orson, however, spent his entire time in Ireland. Connemara. The young Orson had ideas of being an artist. He spent the day painting (he later threw away all his paintings ), and the evenings, if the weather allowed, sleeping in the open by turf fires. He had to be a lonely boy at times, but his time of wandering through the mountains seemed to heal a lot of his hurt. He sold Sheeog, and headed for Inisheer, where he learned Irish dancing, and probably enjoyed himself sufficiently to want more company. He returned to Galway in October, and took the train to Dublin. Mícheál MacLiammóir always thought himself as the great lead actor of the Gate Theatre, which had been put on a sound financial footing by Lord Edward and Christine Longford in 1930, giving it the freedom to offer Dublin audiences modern European plays. Even though he loved Orson, Mícheál was determined not to be overshadowed by his undoubted talent. He succeeded in keeping the young American tied to relatively minor roles, and legend has it that props would mysteriously disappear just as Orson reached for them, or scenery would block the audience’s view of him. Nevertheless when Orson returned to New York in 1932 his mind was firmly made up. He now had a passion for the theatre, and he was determined to become an actor/director. He would take Hollywood by storm! In 1937 he set up the Mercury Theatre (which would create mayhem with its radio production of War of the Worlds ), and he stunned the world by making his masterpiece Citizen Kane, at only 25 years of age. ** But that was all he really achieved. He became a peripheral figure in Hollywood, wandering the world gaining weight, and appearing in mediocre films in order to fund his grandiose, and sometimes doomed, movie projects. And despite MacLiammóir’s attempts to scupper his career, Orson remained indebted to the two men who believed in him all those years before. He regarded them with genuine affection. He invited both men to be the principal guest artists at his summer school at Woodstock, Illinois, in 1934. 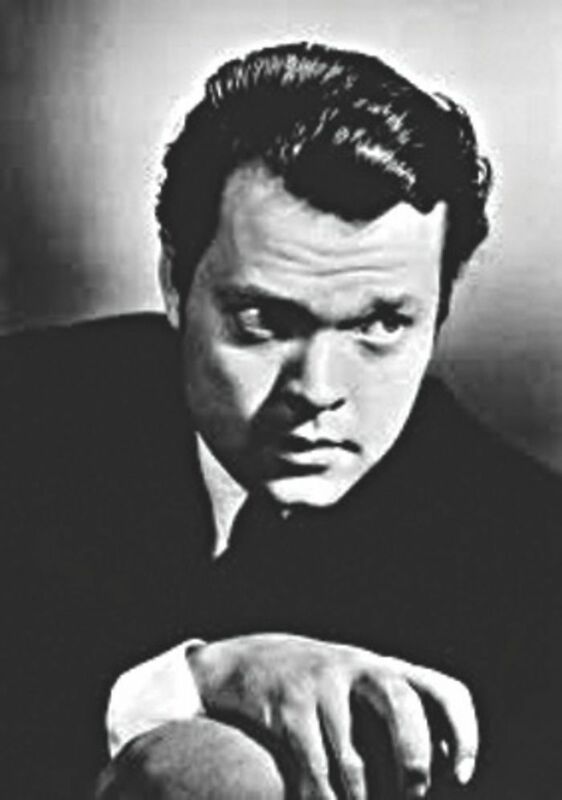 In the early 1950s Orson, recognising MacLiammóir’s acting talents, and clearly forgiving him his little jealousies, asked him to play the major part of Iago in his Othello; and came back to Dublin to make a short film with the partners called Return to Glennascaul, a sort of ghost story set in the Phoenix Park. MacLiammóir also starred in a later TV production of King Lear in 1954. NOTES: *Prehaps Pádraic Ó Conaire ( February 28 1882- October 6 1928 ) is due for a reappraisal. Born in Galway Pádraic was orphaned at a young age, and spent most of his childhood living with his uncle at Ros Muc. He emigrated to London to work in the civil service, became involved with the Gaelic League, and wrote short stories in Irish. He returned to Galway in 1914, leaving his wife Molly Ní Mhanais and their four children, behind. He survived on meagre earnings gleaned from teaching at Gaeltacht summer schools, organising Gaelic League events, and writing. The story M’Asal Beag Dudh describes his amusing attempt to buy a donkey at the Galway market for company on his wanderings. He died at 46 years of age in poverty having written 26 books, 473 stories and six plays. ** It has often been suggested that the lonely childhood of Charles Foster Kane had echoes of Welles’ own earlier life.